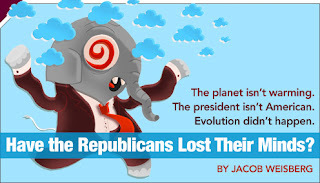 One of the more vicious lies by the left-wing is that they are somehow more scientific or intelligent than the right-wing, such as in this Slate article on global warming, birtherism, evolution, and the debt ceiling. But the left really isn't any better. For every Republican that believes in the "birther" conspiracy, there is a Democrat that believes in the "truther" conspiracy that George Bush was partly responsible for 9/11. The Republican view on taxes/spending is the mirror image of the Democrat view. As the Slate article points out, spending cannot be reduced to the point where it matches taxes. QED, taxes must be raised, despite Republican's claim the contrary. However, our current spending commitments are so high, that no amount of new taxes can pay for them. QED, spending must be cut, in particular, Medicare and social security must be reformed, despite Democrat's claim to the contrary. But it is scientific issues where Democrats are most egregiously off-base. Their overestimation of warming is no more scientific than the Republican's underestimation of warming. Those who deny any warming have occurred are no less scientific than Al Gore's doomsday scenario. The basic science shows conclusively that carbon dioxide is a greenhouse gas, that mankind has raised the amount in the atmosphere, and that the planet has warmed – but that the amount contributed by mankind is minor. The evidence of the "scientific consensus" of the United Nations proving that mankind has caused major changes is tenuous at best, relying upon computer models, irreproducible statistical results, and other quackery. Yet, Democrats make no attempt to debate this scientific evidence, they instead focus on the moral debate. Democrats have completely destroyed the credibility of "science" in the debate over evolution. What makes science better than religion is that when scientists are unsure of something, they admit it, rather than make up stuff. Some of the evidence of evolution is rock solid, such as the fact that the Earth is several billion years old, and that species inhabiting the planet have changed over time. Other parts are just guesses. Scientists haven't a clue as to how life began. Deities or space aliens seeding life on earth is as good a theory as anything scientists have come up with. Yet, rather than admit the areas of doubt, scientists treat Darwin's evolution as a form of religion – you must believe in all of it, even the areas scientists are unsure of. The reason the religious right is concerned is not because science competes with religion, but there is a new state-supported religion competing with their religion. The best way to convince the religious about evolution is to be more scientific, not more religious. Politics is inherently stupid. Politicians don't get the opportunity to discuss these nuances and have to stick to a "message". In the last presidential election, the Republican candidates were asked in a debate whether they believed in evolution. Some (e.g. McCain) said yes, some (e.g. Huckabee) said no. Regardless of their simple answer, though, they all turned out to believe the same thing: that both Darwin's natural selection and God played a roll. Thus, the short answer might be "no new taxes", "no evolution", "no global warming", but you have to look further to find out the long answer. I'm a typical Republican. I believe we have to raise taxes, that Obama was born an American in Hawaii, that the earth is warming, that manmade carbon dioxide has something to do with that warming, and that natural selection is primarily responsible for the diversity of species we see, including man. My beliefs are normal – it's the Democrat's beliefs that are crazy.